Metro is currently preparing a Draft Environmental Impact Statement / Environmental Impact Report (DEIS/DEIR) to identify transit improvements that would provide an alternative to the I-405 corridor by accessing the regional rail network through connections to the proposed Crenshaw/LAX Transit Corridor, currently under environmental review. The study area encompasses approximately 30 square miles and includes the cities of El Segundo, Hawthorne, Inglewood, Lawndale, Los Angeles, Manhattan Beach, Redondo Beach and Torrance as well as the Del Aire and Lennox areas of unincorporated LA County. The project is partially funded under Measure R, the half-cent sales tax approved by the voters in November 2008. 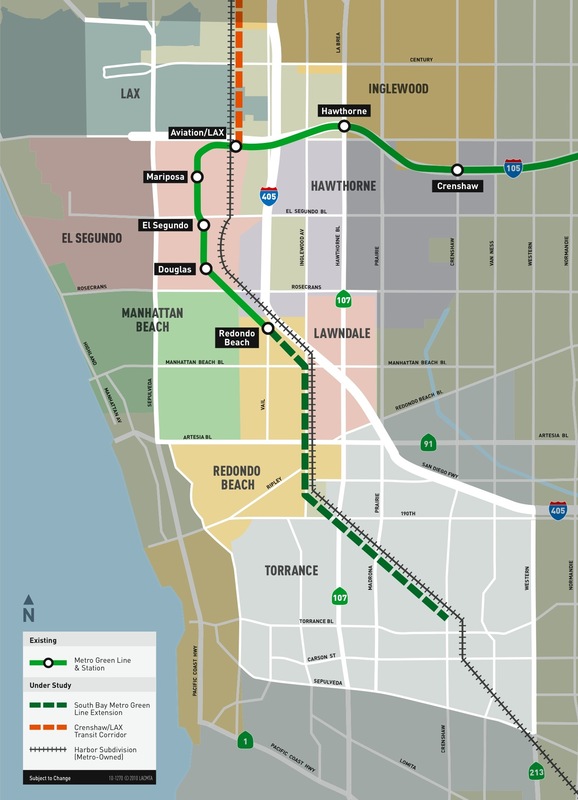 Under Measure R, the project is provided $272 million in funding for the Metro Green Line Extension to the South Bay Corridor. This project is contained in the constrained element of the 2009 Long Range Transportation Plan (LRTP). For information on the project and the Draft EIS/EIR process the public can call 1-800-266-6883 or visit www.metro.net/southbayextension for additional information. Rail to the South Bay has been studied for at least 30 years in my memory. It was expected to go south west of Hawthorne at one time. As a test, I rode the Green Line from Redondo Beach to downtown Los Angeles and found that it takes more than twice the time by automobile. Thus, the ridership tends to be those without cars, I believe. For me to use this new proposed line extension, I would have to spend about 15 minutes walking to the station. For those without “wheels”, it would be great. I do not expect to use this extension very much. Sixty years ago, I rode the “red car” a lot and found it useful to go to Long Beach, Inglewood, Hollywood, Los Angeles, Glendale, Santa Monica, etc.